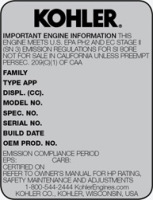 KOHLER engine identification numbers (model, specification and serial) are printed on a silver decal. On VERTICAL engines it is normally affixed to the blower housing of the engine. 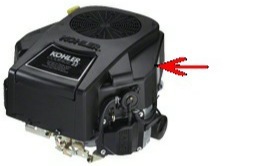 KOHLER engine identification numbers (model, specification and serial) are printed on a silver decal. 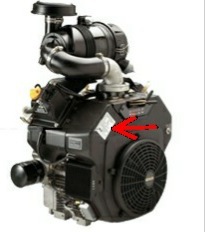 On Horizontal engines it is normally affixed to theto the side of the engine cover. Make a note of your engine identification numbers in your owner's manual for handy reference.